Description: From 8 inches to 2 feet tall. 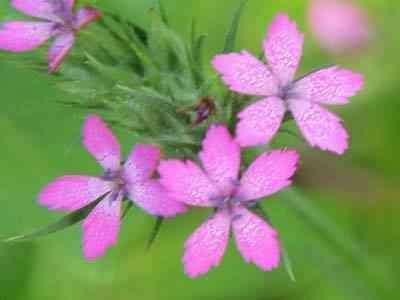 The entire plant is slender and somewhat rigid with needle like leaves, simular to the carnation which is a member of the Dianthus group along with the sweet williams. Flowers are from light to a deep pink with very small white spots formed in clusters with birstly bracts.